Not only for mithai, but Indiranagar's Bhartiya Jalpan is also known for some good North Indian breakfast dishes and snacks such as puris and chole bhature. 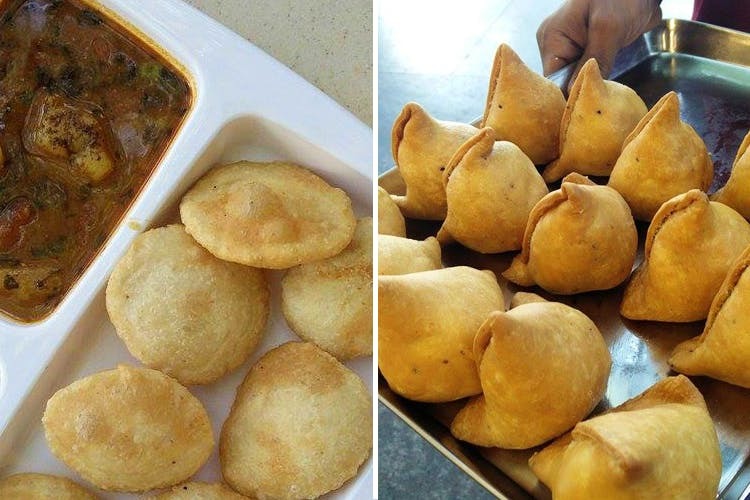 For those who love heavy duty north Indian breakfasts and snacks that includes puri aloo and chole bhature, Bhartiya Jalpan is the place to be. It's no regular mithai shop, but a much fancier upgrade to a traditional one. There is al fresco seating, much like a cafe and you can also sit inside. An entire room inside is dedicated to dry fruits and you can even lounge around in a sofa while you decide what kind of a mix to buy yourself. Though the place looks fancy, the prices are not and here you will get pretty affordable snacks. The Puri Aloo, of course, is what you need to try first and must. They also do Club Kachoris (mini kachoris) served with an aloo subzi. You should also try the chole bhature, and matar puri (a peas puri) also served with a potato curry. Evenings are dedicated to hot samosas, chillas, pani puri and jalebis. Would highly recommend their wafer thin and crunchy jalebis and also their authentic North Indian pani puri. I found the chole in the Chole Bhature a bit too tangy, but the rest of the breakfast dishes and snacks were quite good. Their lunchtime thalis — Special and Shahi are also good value for money with dal, rice, two kinds of veggies including paneer, a choice of rotis, salad, papad and sweet along with bottled water.